Coconut Oil: Dietary Friend, Foe…or Fad? Natalie Digate Muth, M.D., M.P.H., R.D. Once maligned as a cholesterol-raising, artery-clogging, waist-widening ingredient to be avoided, coconut oil has made a surprising comeback among health enthusiasts. While the science of nutrition has long been recognized as volatile and fluid (e.g., Are eggs healthy or not? Is soy good or bad? Margarine or butter? ), the rise of coconut oil from a demonized “bad” food to the purported “cure-all” for a variety of health ailments is unexpected. The nutritional composition of coconut oil remains the same—namely, about 90 percent saturated fat—so why the sudden change of heart? The growing interest in coconut oil is due to at least two factors. First, the scientific understanding of the effects of saturated fat (the main ingredient in coconut oil) on heart health has evolved. And second, a growing number of people who either avoid animal fats or are looking for a new flavor have discovered that coconut oil, among its other purported benefits, can transform a bland dish or baked food into a masterpiece. The 2010 Dietary Guidelines for Americans and the American Heart Association recommendations for optimal heart health advise consumers to avoid saturated fats and restrict intake to less than 10 percent of total calories consumed. Physicians, nutritionists and other health experts have long warned patients and clients of the risks of a diet that contains too much saturated fat—primarily, a sharp rise in low-density lipoprotein (LDL), also known as the “bad” cholesterol. Saturated fatty acids do not contain double bonds between carbon atoms and typically are solid at room temperature. Saturated fat comes in primarily four forms in the food supply: lauric acid, myristic acid, palmitic acid and stearic acid. Animal fats such as red meat and full-fat dairy products contain mostly palmitic and stearic acids, while tropical vegetable oils such as palm and coconut oils contain primarily lauric and myristic acids. The different types of saturated fat induce different effects on cholesterol. Compared to other saturated fats, stearic acid exerts a beneficial effect on cholesterol, in that it decreases LDL cholesterol and decreases the ratio of total cholesterol to high-density lipoprotein (HDL) cholesterol. (Though when compared to unsaturated fats, stearic acid increases LDL, decreases HDL and increases the ratio of total cholesterol to HDL cholesterol). Lauric acid and myristic acid cause a much greater increase in total cholesterol than palmitic acid. While lauric acid, the main saturated fat in coconut oil, causes a large increase in cholesterol, the increase comes mostly from increasing the high-density lipoprotein (HDL), the so-called “good” cholesterol (Kris-Etherton & Innis, 2007). This differential elevation in “good” cholesterol (and thus a decrease in the total cholesterol:HDL cholesterol ratio) is one reason that many health enthusiasts are embracing coconut oil with such enthusiasm. While coconut oil is mostly comprised of lauric acid, it does contain other types of saturated fat that raise the “bad” LDL cholesterol level. However, even though saturated fat raises LDL levels, a growing body of scientific evidence suggests that saturated fats may not be quite as bad as previously believed. A meta-analysis published in 2010 evaluated the findings of 21 studies that looked at the relationship between saturated fat intake and risk of coronary heart disease, stroke and cardiovascular disease. The researchers found that even at the extremes of very low intake compared to very high intake of saturated fat, there was no difference in any of the studied health outcomes (Siri-Tarino et al., 2010). However, a pooled analysis of 11 studies found that when saturated fat is replaced with other types of fat (especially polyunsaturated fatty acids), cardiovascular disease risk decreases significantly (Jakobsen, 2009). These studies and others like them have provoked discussion and debate in the health and medical communities around the role of dietary fat and health. It is not the amount of fat intake, but rather the type of fat that is important for health. With that said, fat is more calorically dense than carbohydrates and proteins, and consumers should be careful to balance calories consumed with calories expended. The evidence against saturated fat is “not as strong as the dietary guidelines may have interpreted,” but polyunsaturated (especially) and monounsaturated fats are clearly healthy. Saturated fats should not be viewed as “good for you,” but a healthy, balanced diet can include saturated fats. Replacing saturated fat with polyunsaturated fat (like omega-3 and omega-6 fatty acids) is beneficial for overall health and cardiovascular disease-risk reduction. Trans fats are unhealthy and should be avoided. Remember that dietary fats are never purely one type of fat, and thus the goal should be to eat a balance of food types, rather than focus on specific nutrients. So what does all of this mean in the case for (or against) coconut oil? Virgin coconut oil may exert a modestly beneficial effect on blood lipids (through elevation of HDL cholesterol) and its regular consumption probably will not lead to harmful cardiovascular health outcomes. However, oils that are high in polyunsaturated fatty acids (e.g., safflower, poppyseed, flaxseed and grapeseed oils) and monounsaturated fatty acids (almond, avocado and olive oils) probably provide greater health benefits. Note that partially hydrogenated coconut oil is detrimental to health due to its high trans-fatty acid content. 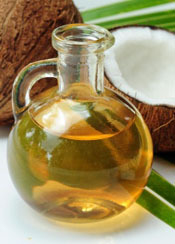 Of course, coconut-oil connoisseurs love it for much more than its health profile. While some mono- and polyunsaturated fats may be healthier, they do not have the same desirable cooking characteristics of coconut oil, such as the stability to withstand high temperatures, the sweet texture or the rich taste, all of which make it ideal for cooking. While many of the purported benefits of coconut oil have not been rigorously studied, some people report improvements in weight, diabetes, chronic fatigue, Crohns disease, irritable bowel syndrome, thyroid conditions and skin health. As research evolves, these claims may be substantiated or proven incorrect. In the meantime, it may be time to give the illustrious coconut oil a try. Jakobsen, M.U. et al. (2009). Major types of dietary fat and risk of coronary heart disease: A pooled analysis of 11 cohort studies. American Journal of Clinical Nutrition, 89, 1425–1432. Kris-Etherton, P.M. and Innis, S. (2007). Position of the American Dietetic Association and Dietitians of Canada: Dietary fatty acids. Journal of the American Dietetic Association, 107, 9, 1599–1611. Siri-Tarino, P.W. et al. (2010). Meta-analysis of prospective cohort studies evaluating the association of saturated fat with cardiovascular disease. American Journal of Clinical Nutrition, 91, 3, 535–546. Zelman, K. (2011). The great fat debate: A closer look at the controversy—questioning the validity of age-old dietary guidance. Journal of the American Dietetic Association, 111, 5, 655–658. Natalie Digate Muth, M.D., M.P.H., R.D., is a pediatrics resident at UCLA Mattel Children’s Hospital. She’s also mom to two young children, Tommy (3) and Mariella (11 months). Could Your Client Really Be Allergic to Exercise? Your female clients are often met with a whole different set of challenges, thanks to pregnancy, menopause and other physiological changes unique to women. And those challenges often mean frustration for you and your client. Learn how incorporating specific yoga poses can help them relieve discomfort in the first trimester of pregnancy, hot flashes during menopause, bone loss associated with osteoporosis and stress they experience in every life stage. Don’t Miss Your Chance to Win $400 in e-Credits! Help older adults build muscle while giving yourself a chance at $400 in ACE e-credits. Register for the AARP Fitness and Wellness Program between April 15 and May 15 and you could win up to 2.0 free CECs. A special designation on our ACE GetFit™ site featured on AARP.org could also increase your exposure to potential new clients who need your help. One size may not fit all when it comes to designing workout plans, but there are three simple things you can do with all of your clients to make sure your workouts are safe and effective. Incorporate these activities and discussion points to make sure you’re designing a workout program that fits each unique client. You’ll build rapport and trust that will keep them motivated to continue with your program.